But household pests can also be a danger to your family. 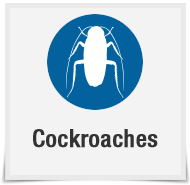 Cockroaches produce allergens that can trigger asthma and allergies. Mouse droppings can also do the same. Flies and mosquitoes can carry germs and diseases. - Pick up all food spills and crumbs right away. - Keep your counters, tables, sinks, and floors clean. Clean and dry dishes after having meals or snacks. - Clean under large kitchen appliances, such as refrigerators and stoves. Food debris can often collect in these spaces and attract pests. - Store food in containers with airtight lids or in the refrigerator. If food is stored in cardboard boxes, make sure the boxes are sealed. Cockroaches like cardboard and can get into opened boxes easily. - Keep your trash in a container with a tight lid, and take out the trash often. Place outdoor trash bins as far from your house as possible. - Fix household leaks and clean up any excess moisture on counters or sinks right away. Cockroaches like water and can swim.